When you hear the word “fall”, what is the first food you think of? For me, it is always soup! There is a crisp-chill in the air that makes me want to enjoy a hot bowl of comforting vegetable soup. This recipe is just the thing to use up the seasonal vegetables of fall in a hearty and savory soup. 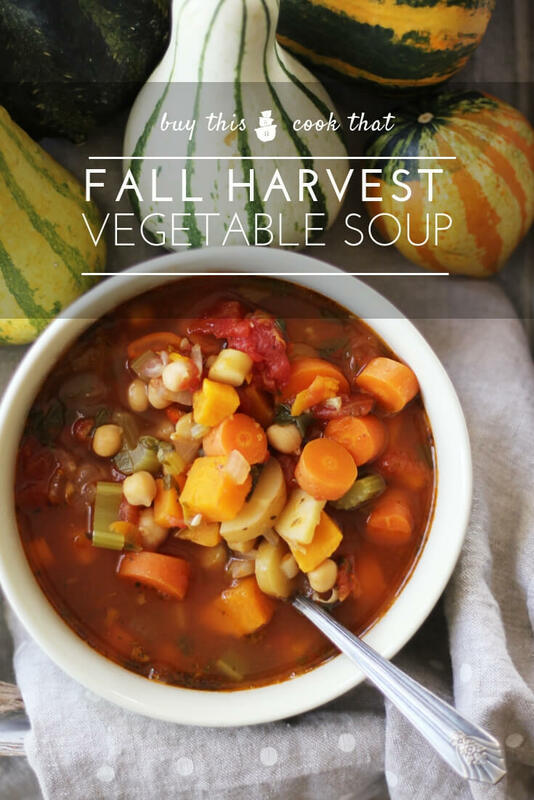 Read more about our Fall Harvest Homemade Vegetable Soup. Fall is my favorite and I consider it to be the perfect time of year. The weather is cooler but there are still fresh, seasonal vegetables available. 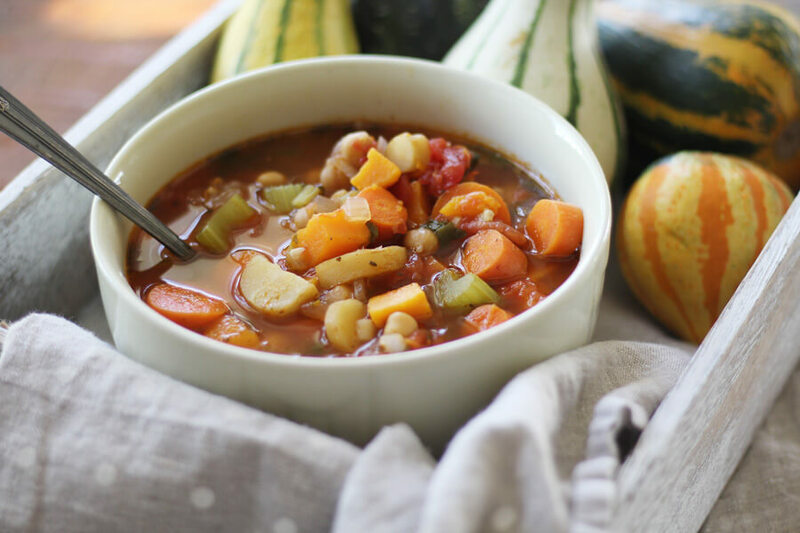 One of my favorite fall meals is a Fall Harvest Vegetable soup made from wholesome and hearty veggies. 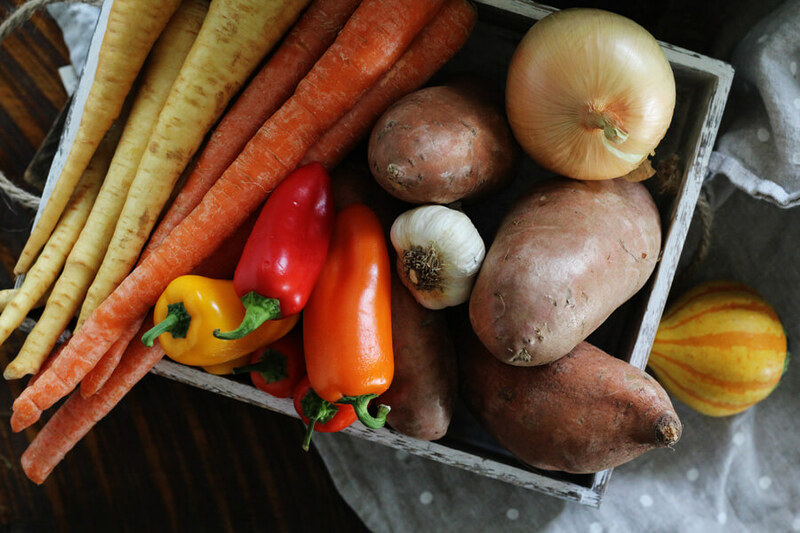 This recipe is loaded with colorful peppers, earthy parsnips, fresh carrots, sweet potatoes, garlic and more for a savory and hearty fall soup that is perfect for chilly fall nights. 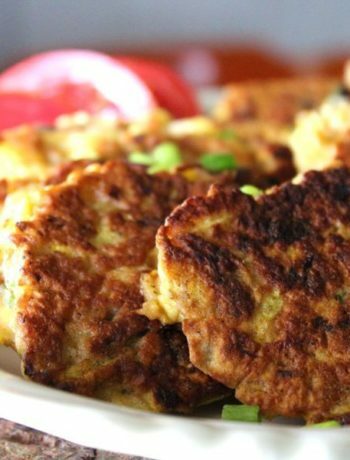 It is also vegetarian if you are looking for a meat-free meal option. 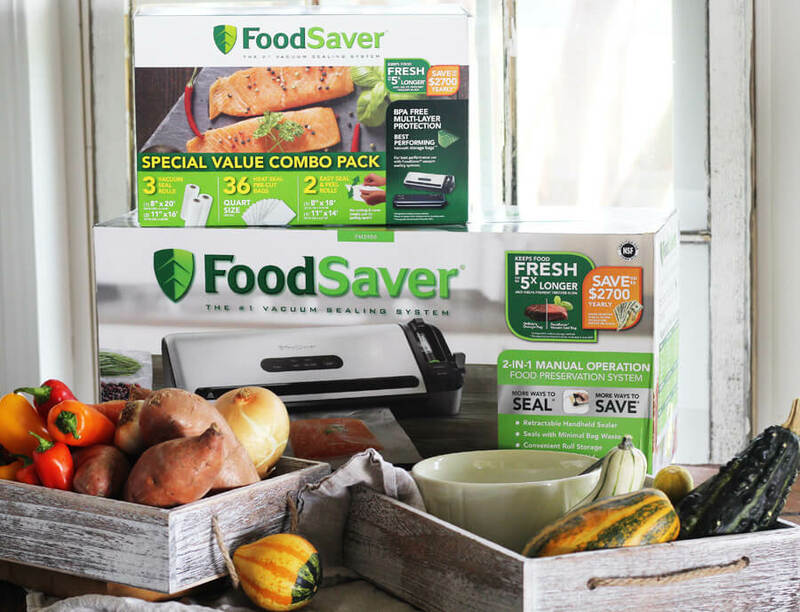 Fall is also the time to take advantage of the season’s bounty by freezing and storing the abundance of fall vegetables by using your FoodSaver® FM3941 Vacuum Sealing System from Costco. With a Costco membership, you can save big in the month of November. There is also a handy “Marinate” feature on the FoodSaver® FM3941. By taking all of the air out, you can ensure your meat will be cooked evenly throughout. 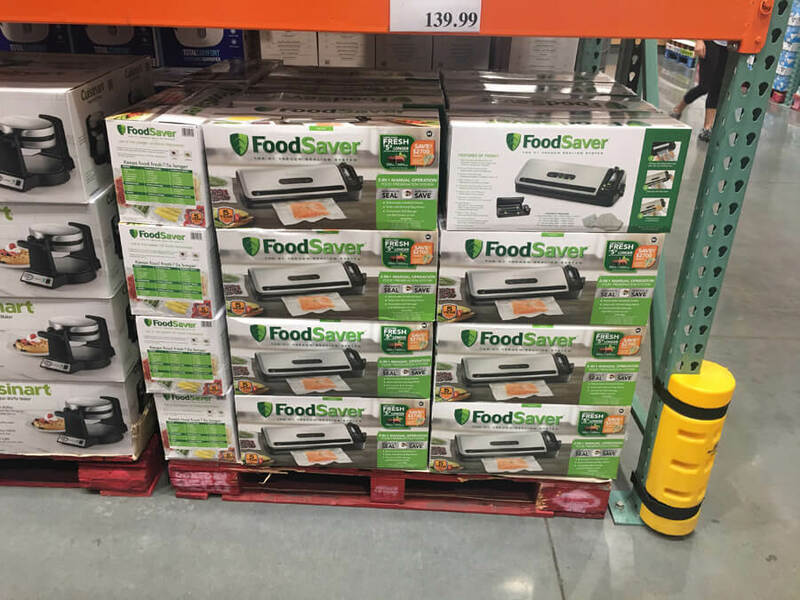 You can find the FoodSaver® FM3941 system in the kitchen appliances aisle at your local Costco. 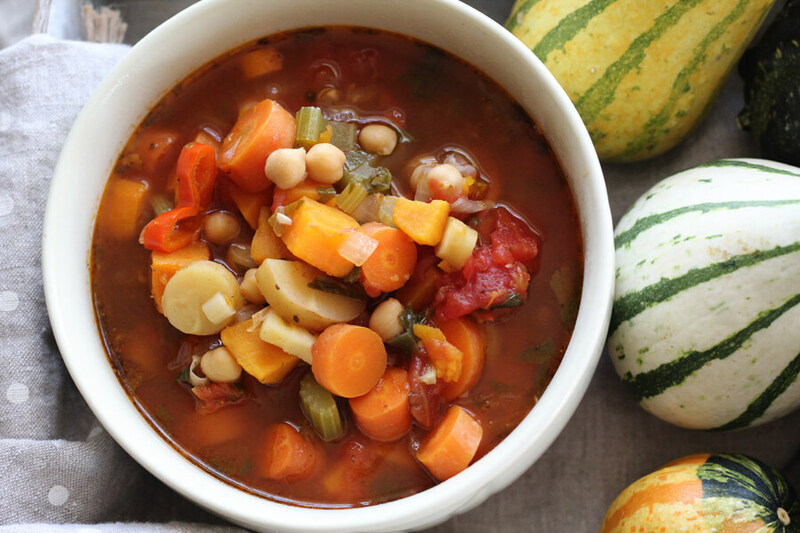 This homemade vegetable soup is packed with wholesome and colorful vegetables. Not only is this recipe easy to make, it is also beautiful to serve. You have to try our Foolproof French Onion Soup. First, cook the prepared vegetables in olive oil. 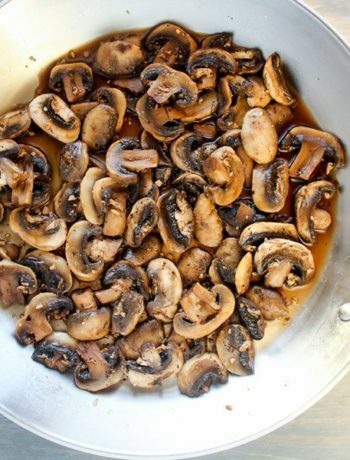 You want the flavors of the veggies to deepen by cooking in the oil until they are lightly browned but still firm. 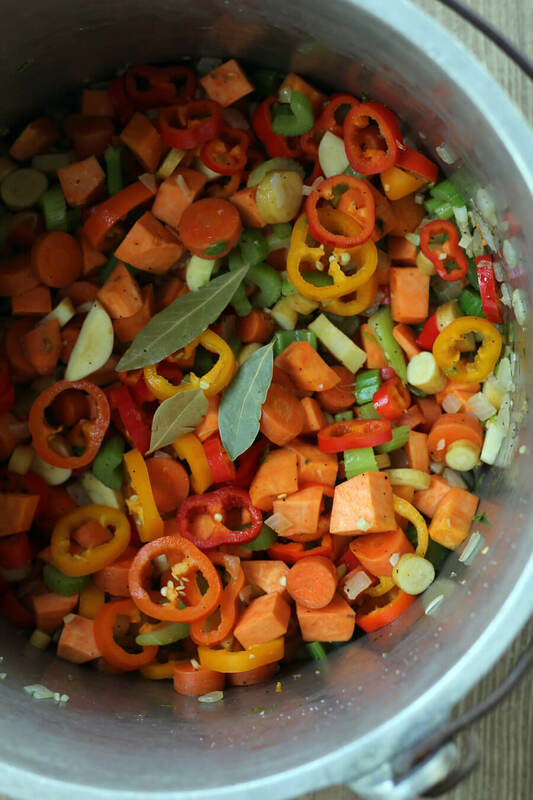 This gives your homemade vegetable soup a flavorful start. Then, stir in the tomatoes, garbanzo beans, vegetable broth, water and seasonings. Bring to a boil, stirring frequently. Reduce heat to low, cover the soup with a lid, and slow-simmer for about 45 minutes. You can eat as soon as the parsnips and carrots are tender. You can easily mix and match the vegetables based on what is seasonally priced where you live. I live in the South where we have a longer growing season, and peppers are still in season and an affordable ingredient for me well into fall. I decided to buy extra and freeze them. This saves money and these yummy peppers. 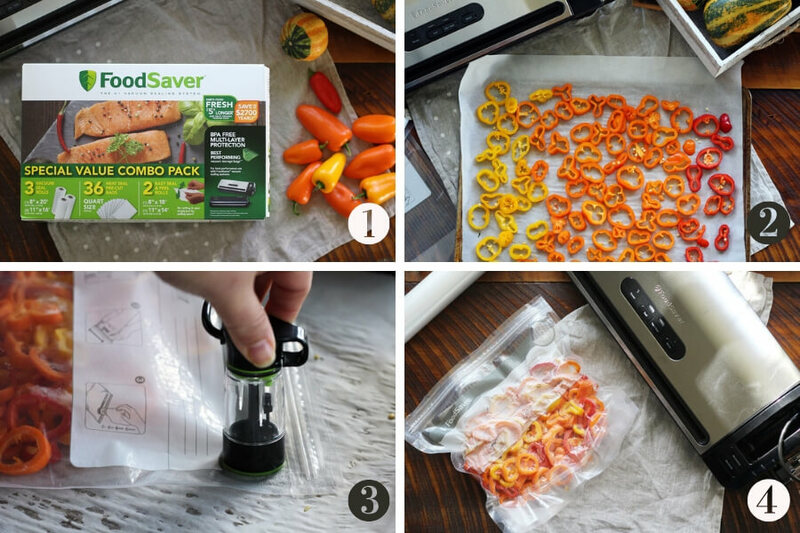 Transfer the frozen peppers to a FoodSaver® bag. Proper use of a FoodSaver® FM3941 keeps food fresh up to five times longer than ordinary storage methods like zipper bags, foil, plastic wrap and containers. FoodSaver® System includes vacuum seal bags, vacuum zipper bags and containers designed to work together with vacuum sealers for optimal performance. I am in love with the built-in Fresh Handheld Sealer. This makes it easy for me to use a few peppers at a time, then zip to seal, remove the air, and toss the rest back in the freezer. 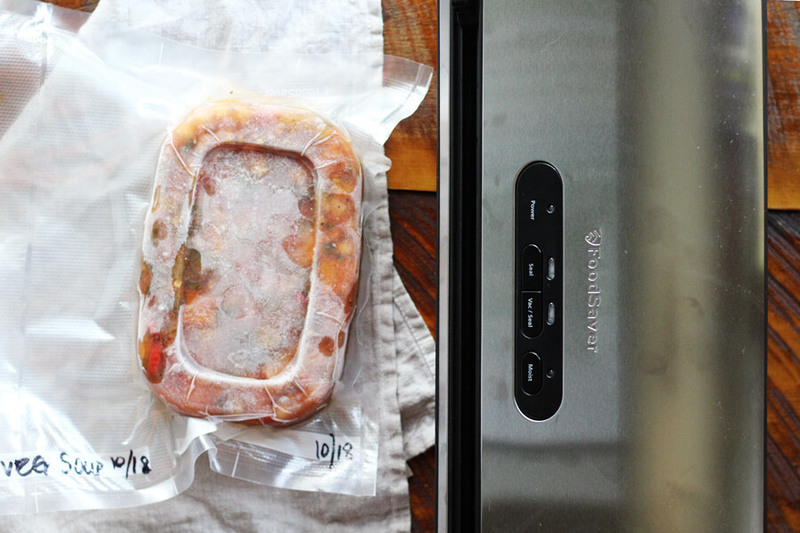 It also makes refrigerator preservation fast and easy in addition to keeping food fresh in the freezer with airtight vacuum seal bags and rolls. 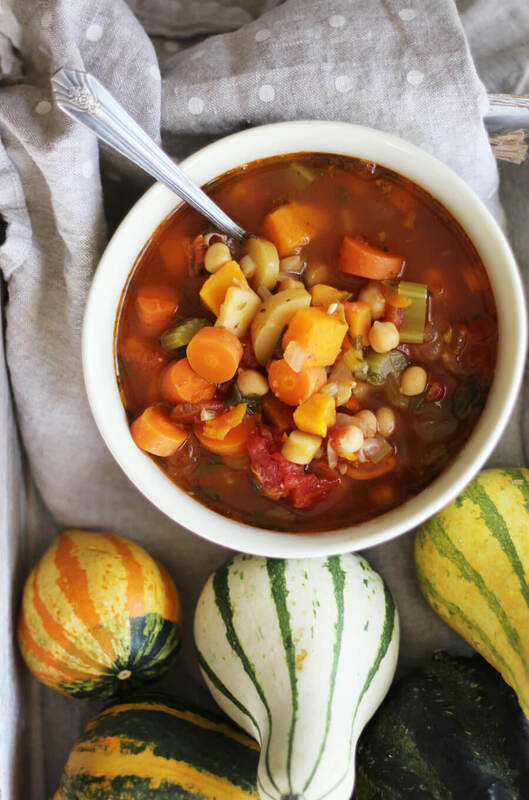 Doesn’t this Fall Harvest Homemade Vegetable Soup look like a bowl full of delicious? And it smells amazing while it is simmering on the stove. You can even make it in your slow cooker. Just cook on low until the veggies are tender. 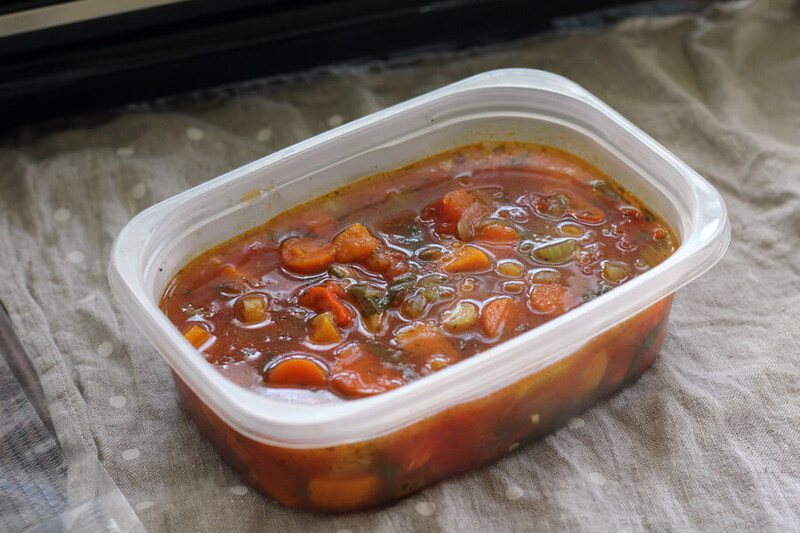 This homemade vegetable soup is ideal for meal-prep, too. 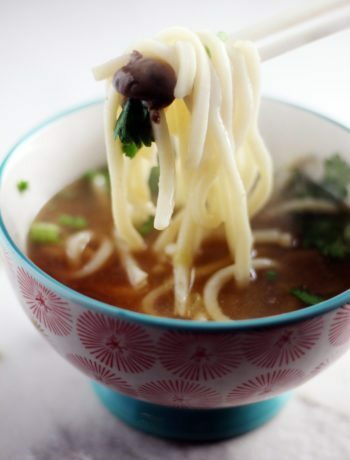 A cup of hot, comforting soup to go with your lunch makes your day better. I like to make a double batch of soup. Some for now, and some for later. To perfectly freeze your soup using a FoodSaver® FM3941, first portion the soup into containers. Pop in the freezer until the soup has frozen solid. Remove the frozen soup and vacuum and seal. Perfect portions of soup that will keep so much longer than other methods. No frost burn, either. All you have to do is reheat and serve. Major time saver. Plus you get to savor flavors of the fall harvest months from now. Speaking of which…time for another bowl! This is so good. The savory tomato and vegetable broth with peppers, parsnips, sweet potatoes and carrots. 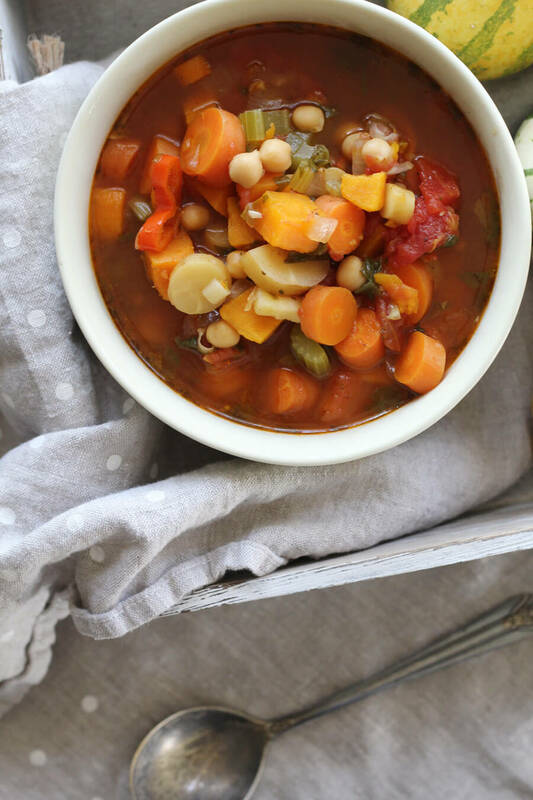 So hearty and filling, this will be your new favorite vegetable soup recipe. This savory soup is loaded with the harvest of fall. Carrots, parsnips, sweet potatoes and more make this homemade vegetable soup taste so good. Heat oil over medium-high heat in a large pot. Add garlic, onion, celery, carrots, parsnips, sweet potatoes and peppers. Cook and stir for 10 - 15 minutes, stirring frequently. Stir in the undrained tomatoes. Add the garbanzo beans. Pour the vegetable broth and water over the vegetables. Stir in the bay leaves, seasoning, salt and pepper. Add the chopped spinach, stir and bring to a low boil. Reduce heat, cover, and simmer for 45 minutes or until the vegetables are tender. Taste and re-season as desired. Serve hot.